Ever wonder what inspired the beautiful shapes of the Sydney Opera House? How the concrete vaults were engineered? Or the publicly owned project was paid for? On Sunday October 12 Bob Bruce will answer these questions and more in a spirited presentation on the competition, design issues, engineering marvels and political struggles that shaped the process of building the Sydney Opera House. In 1969 Bob Bruce traveled to Sydney to research the Opera House, then in it’s 10th year of construction. 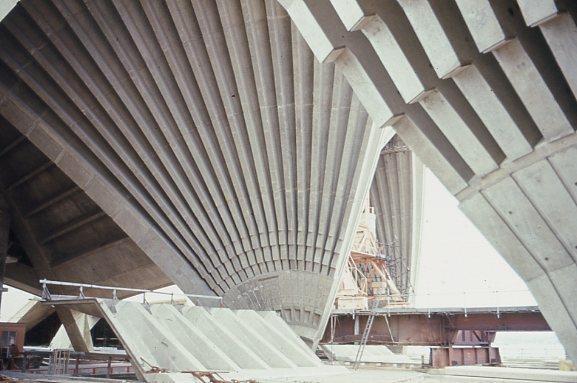 Bob’s investigation included reading through competition entries at the Sydney Public LIbrary and visiting the construction site, where he made photographs of the vaults showing details not visible in the finished structure. Bob’s photographs will be featured in the Gallery and sprinkled through his presentation, along with Jørn Utzon’s architectural sketches, historical site photos, and diagrams explaining the elements of the structure. The Gallery will open at 5:30, with the presentation running from 6-7 pm, followed by a reception with live DJ Elysium Alps. Come by and ask questions, discuss architecture and make merry!